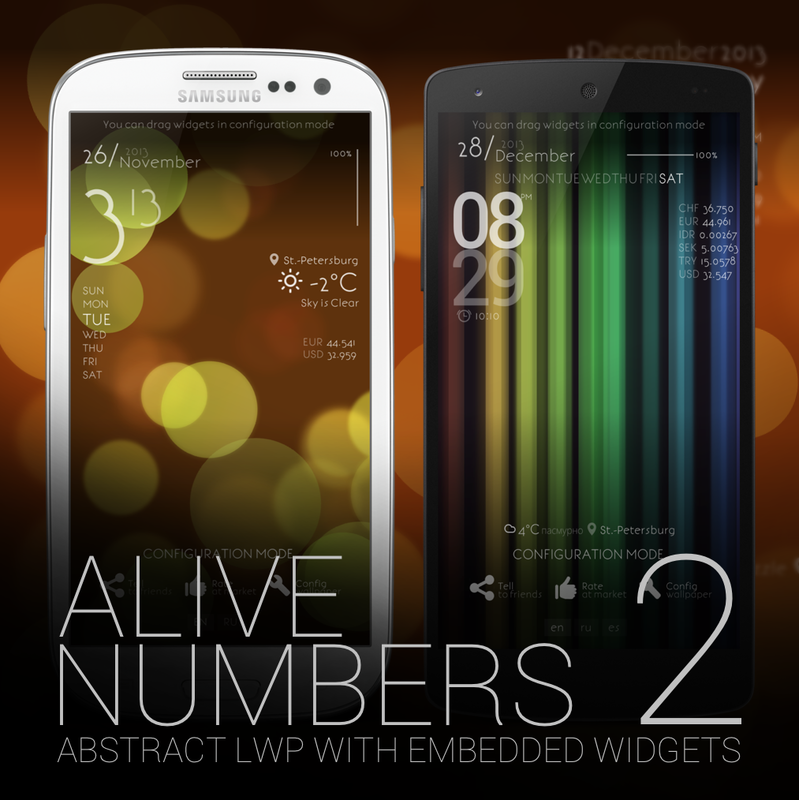 Live wallpaper contains several animations. Default background animation is particle system of flying numbers with tricky blur algorithm. All particles are rendered in single pass. This gives only 3% cpu load under Samsung Galaxy Note 2. Wallpaper do not consume battery resources when is not visible – so power loss is not an issue. 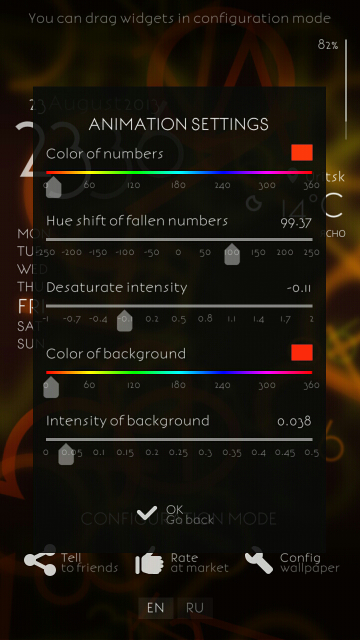 Count of particles, speed, color, fade options, desaturation can be adjusted in options. You can switch interface language at any time from options and this does not correlate with device locale settings. If details or text are too small you can set global screen scale as you like it (at engine options). Everything will become bigger or smaller as you like it. You can change the values and see the results immediately through the transparent layer. Clicking on widgets launches default applications from system – like calendar, clock, battery consumption info, etc. 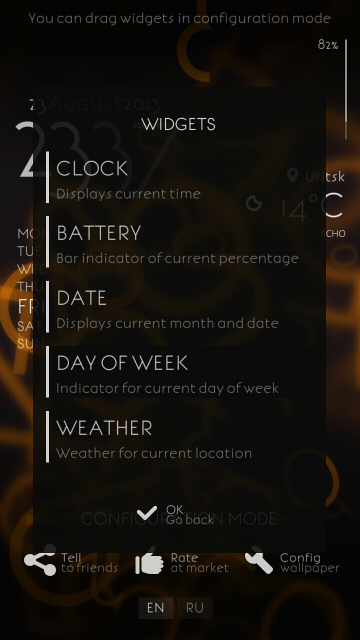 This behaviour can be disabled in options ( for every widget separately ). From options you can switch base background animation. Great app I absolutely love it. Made my home screen a lot less cluttered and uniform. Incredibly neat and beautiful!!! 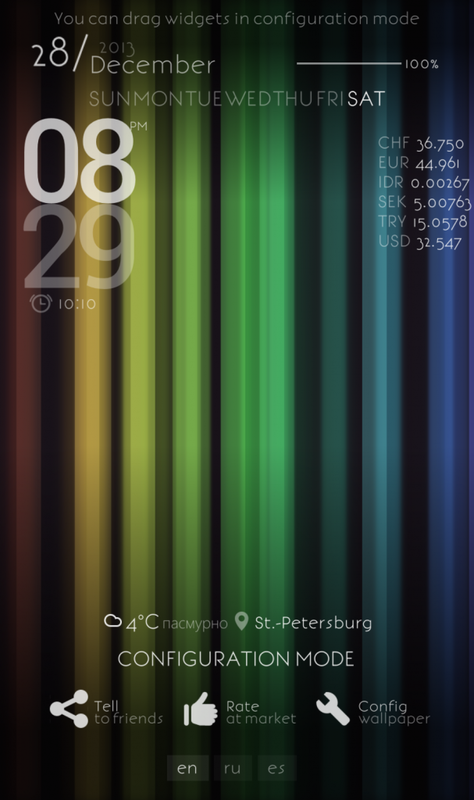 I love this live wallpaper, love the fact that it comes with in built widget, 5 stars straight!! Excellent New parralax effect is great. 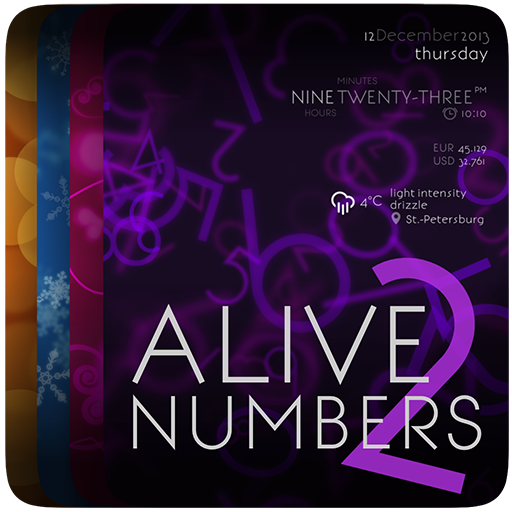 My Kind Of Wallpaper Alive numbers was my default wallpaper for the last 6 mos. This one, the newer version is so much better. Configuration is a breeze. Keep up the good work! 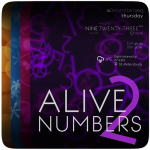 There you can make Alive Numbers 2 to support your native language. The list of languages – Bulgarian, Danish, German, Spanish, Finnish, Franch, Croatian, Hungarian, Indonesian, Italian, Lithuanian, Latvian, Norwegian, Dutch, Polish, Portuguese, Romanian, Russian, Slovak, Slovenian, Serbian, Swedish, Turkish, Ukrainian, Vietnamese. Please note – localization tool is in beta state – please contact me in case of any errors, bugs, etc. Next section contains information about updates and should be updated when new versions will come at market. Main upper text will be fixed to reflect changes, but lower part can contain additional images and details. Clicking on widgets launches default applications from system – like calendar, clock, battery consumption info, etc. 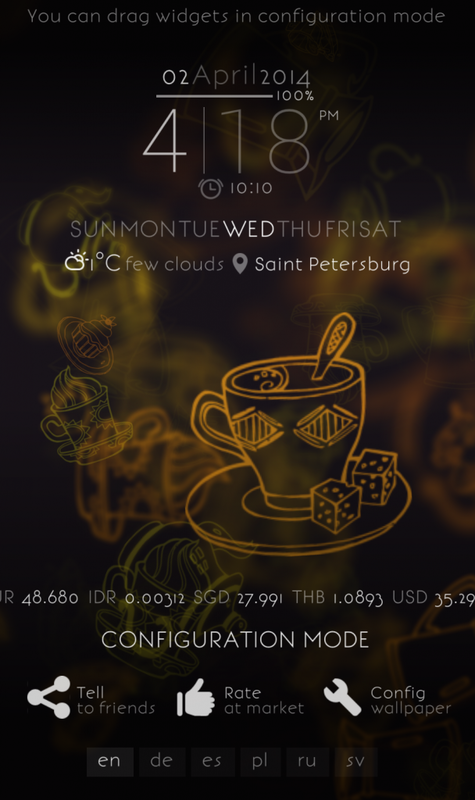 Weather widget now has weekly/hourly forecast. Brand new Parallax effect using accelerometer for inner particle system. 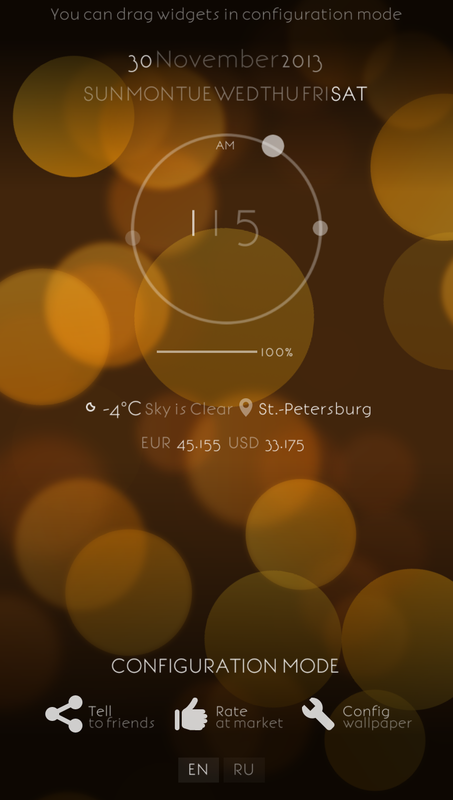 New widget: Currency Rates. Exchange reference rates from official European Central Bank feed (daily updated). You can select your local currency as the base and monitor the list of rates (up to 28 items). 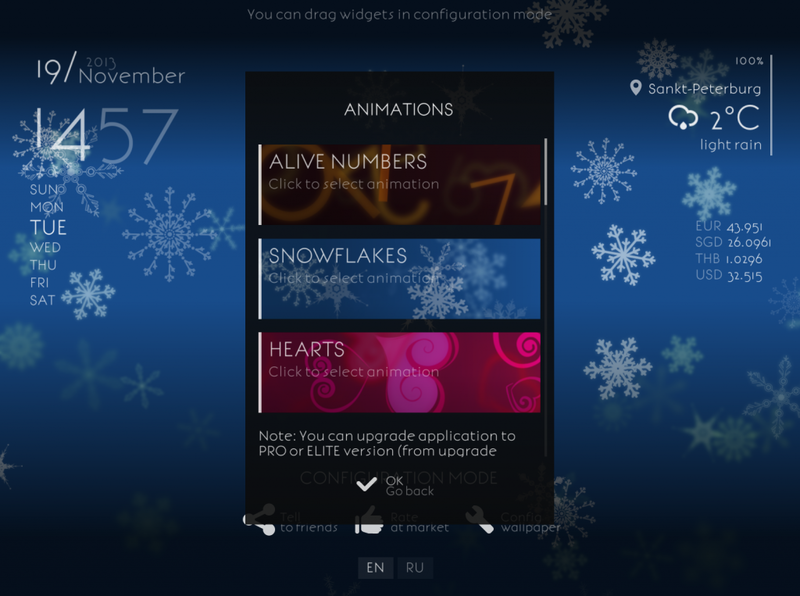 Two new animations for background – snowflakes and sweet hearts. New global widget settings section was added. 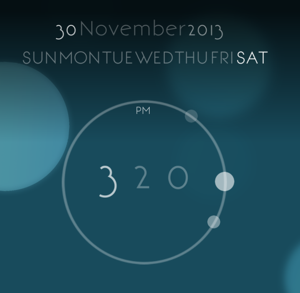 You can set default font for widgets. Clock has separate option for font. New animation background was added – circles. 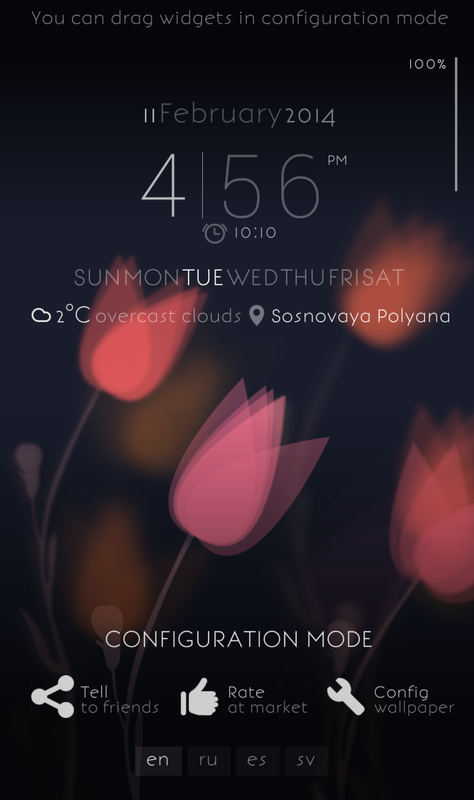 Its very similar to iOS7 live wallpaper. 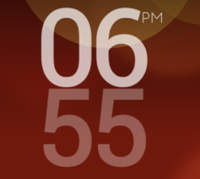 New clock styles for clock widget were added and old styles were improved a bit. PM/AM label was added for 12h format clock. 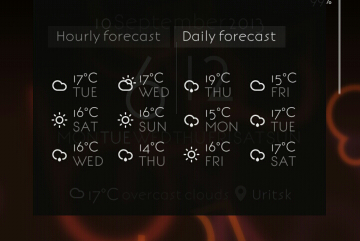 Weather widget now has manual refresh button located on forecast panel. Also location now is displayed as city name – not local area of city (there is new option for that). Any suggestions are welcome at comments. 1. Could you make the clickable widgets optional? 2. Is it possible to create a settings menu according to Google’s design guidelines, the current one is not very good visible due to the adjusting font and the transparency. 3. 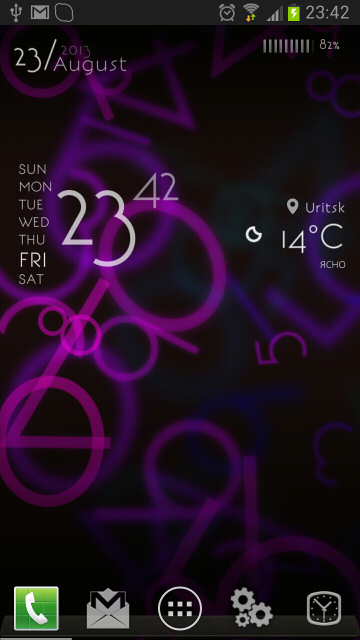 I’d like to use my own wallpaper in stead of the moving numbers. Could you perhaps implement that as an option? But even whitout the above mentioned points, I’ll still be using your wallpaper because it’s simply very nice! Hi Rudie, Thanks for your suggestions. 1. Yes, i probably could add the option that will disable such clicks. 2. About guidelines – as i understand you want more readable settings – bigger font and less transparent back. The idea of transparency was to make visible effect of option’s change at real-time. As for size you can make everything bigger at engine options. Anyway, i plan to implement a selection from several fonts (which will include standard android Roboto font) and enlarge menus. 3. About your custom wallpaper – you mean just static image? I really love this.. just can’t use this cause it crashed all the time nexus 4….I can’t enter into settings… congrats anyway!!!! Thanks. If you have android 4.4 and ART runtime enabled – i hope to release patch for it soon enough. I’m on ART android 4.4 waiting for the patch then.. thanks for the quick reply…. Hie this app is great. I loved every single animation. And especially the sunshine unlock effect that came with it as I didn have it before in my note 3. But acter the kit kat 4.4 update the effect is no longer there. Anyone facing the same prob? Hello, thanks. I think sunshine effect was part of locker application you used before and either it was just disabled during the update or it was completely changed. You can try installing to another device and check it. Does it install on android 6 ?